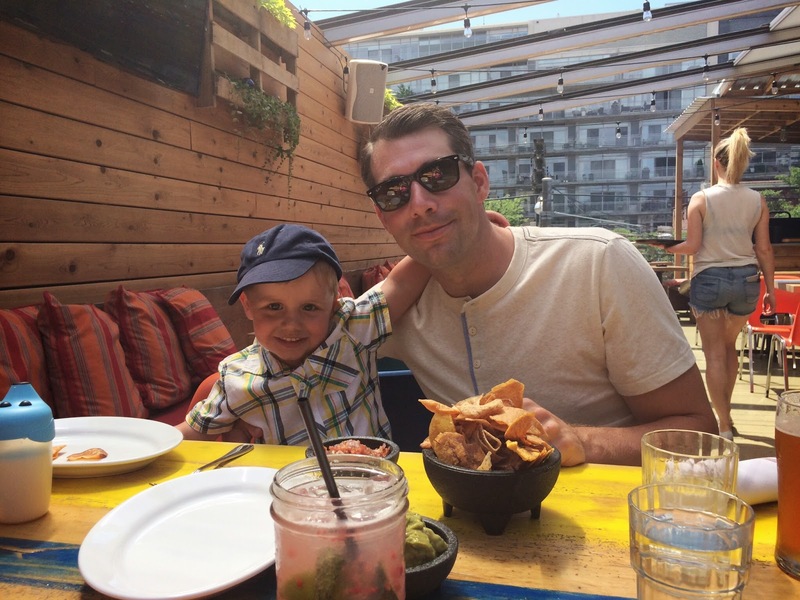 One of our favourite things to do is go out for supper, and we weren't about to stop doing that when we had E. We go out fairly often with E and have done so since he was little. 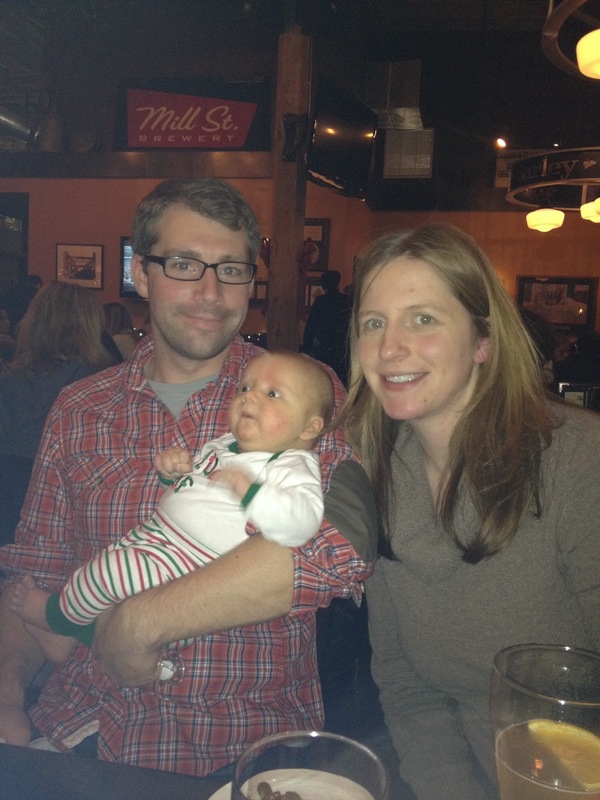 When E was about three months old we met some friends at The Drake for supper. 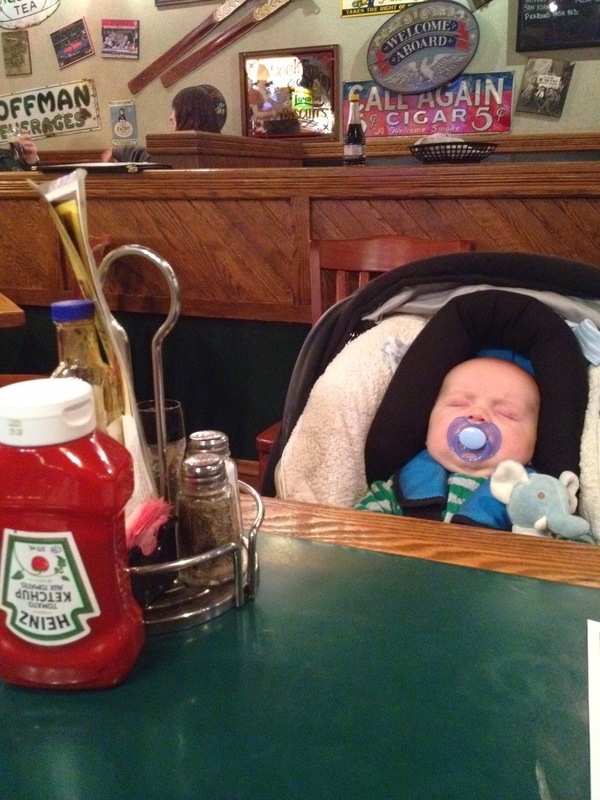 After I fed him, we put him in his carseat and tucked him under the table. When it was time to leave, we brought him out and the people next to us were shocked to see that we had a baby with us the whole time. 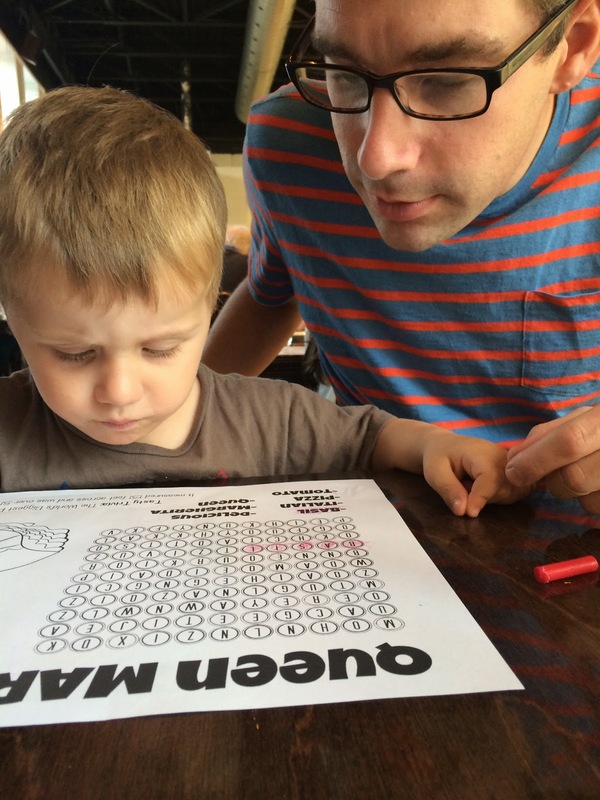 If you are reluctant to take your young child out to a restaurant, I want to offer these tips. The obvious caveat is every kid is different, I'm not an expert, but these are things we do that work for us. I think if kids get used to being out in public early on, then it will become a habit and going out will become easier. E has not always the quietest kid at the restaurant but he is learning about how to behave when we are out. Don't limit yourself to Boston Pizza and McDonalds. Not that those places aren't great, but there are many more options than these. A lot of trendier restaurants offer kid menus with a few more choices than chicken fingers or grilled cheese sandwiches. When choosing a trendy place, look for restaurants that have a buzz to them, preferably with music, and other families. We like to go between 5:30 and 7:00 so that even if they are not typical family restaurants we're gone before the people who aren't interested in dining with children arrive. 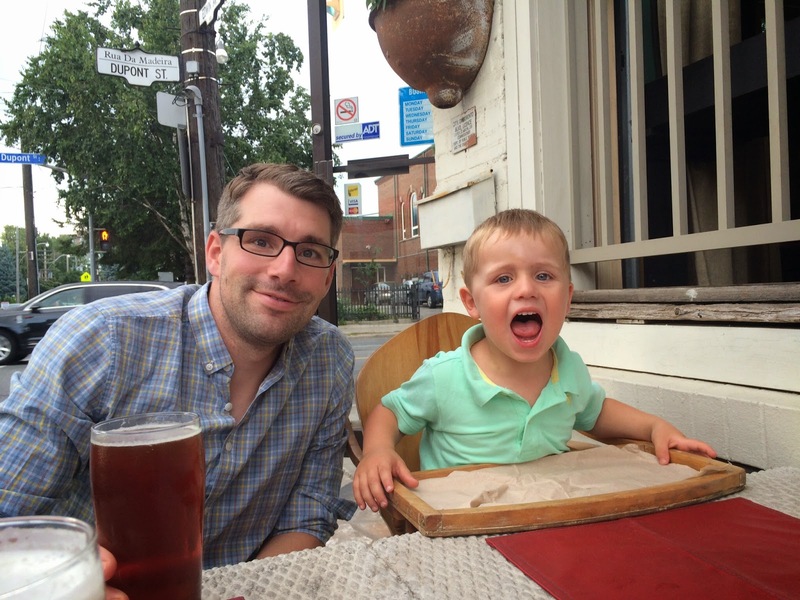 Patios are great for exuberant children. We had this little seat that we took everywhere so if there was no high chair then we could still strap E into his seat. It works with just about every chair we've run into. Bring extra food in case you have to wait for a table, or if your kid doesn't want what is on the menu. This is obviously more important when they are younger and eating mostly soft food. Not all restaurants have room for strollers or change tables, so be aware of those restrictions so you can plan around them. If your kid needs a covered cup, bring your own from home. It's also a good idea to bring a plastic plate, little fork, bib, and lots of wipes! Also remember that not all servers have children, so they don't think twice about putting knives, full drinks, and hot plates in front of children. Be aware of what's going on so you can limit accidents. We like to ask for all of the food to arrive at once, rather than having E's come out as soon as it's ready. If E has finished before we get our food we then have to try and entertain him while eating our own food. If your kid doesn't touch his main meal, and only wants to eat his french fries, that's okay. If your kid is tired and getting fussy, finish up quickly and leave. 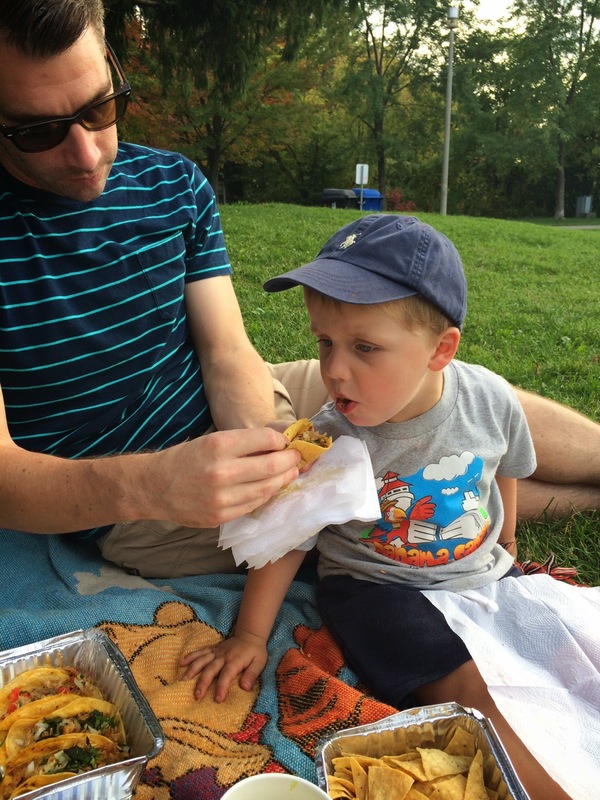 If you realize that it will take awhile to get a table, maybe a take out meal to eat at a park is a better option. And yeah, we hardly ever go to MCD and we've never been to Boston Pizza. I mean I'm not going to take my kids often to a fancy steak house but we've been to some pretty nice places. Great idea for a post-- I might borrow it one of these days to give my very own tips. Barque on Roncesvalles, Queen Margherita Pizza on Jane, La Cubana on Roncesvalles (although no reservations so you may need to walk up the street until your table is ready), The Drake for brunch. These are all pretty West, not really downtown, but they are all reachable by TTC and have a great family vibe, but also trendy. Real Sports by the ACC is good whenever there is no Leafs or Raptors game going on when they are super busy. We have also been to Earl's, the Keg, and Joey Eaton Centre, all in the downtown area, which are chain places, but still trendy and fun.